Maybe it’s time for me to give up on Gilliam. What is there to say about a director whose sensibility you so fundamentally don’t share that you’ve not seen his two reputed masterworks (BRAZIL and TIME BANDITS) and don’t feel guilty about it? I’ve seen most of Gilliam’s feature films from MUNCHAUSEN on, and I don’t really care for any of it — and largely for the same reason. They all feel overdone, overstuffed and manic — fundamentally undisciplined works of wretched excess. Gilliam needs to be reined in, and so giving him money to make an “imaginarium” movie was, predictably, an invitation to indulge his worst tendency — to self-indulgent, curlicued elephantaisis. His Monty Python animation works in that context, because a few seconds of gesture, of cutaway, of sudden subversive commentary. And it was surrounded by the Python troupe. But it’s never worked for 90 consecutive minutes as the whole show and I can’t imagine doing so. Scenes of someone being picked up by a jellyfish arm, flying through the air and then being dropped onto a gigantic thumbtack — it sounds great in conception, I suspect it looks great on the storyboards. On the screen in PARNASSUS, it comes across as leaden, slow and totally lacking in the lightning-fast whimsy that made the Python cut-ins so awesome. We’re expected to *admire* this stuff? Which is a shame because Gilliam is obviously talented and has ideas. And his career has frequently been snake-bit. There’s no good time for a man of Ledgers age to die, of course, but Christopher Nolan has Ledger’s work entirely in the can, while Gilliam has to scramble. It also makes the first view of Ledger (hanging by the neck) a bit icky; inevitably, the story structure involving Johnny Depp, Jude Law and Colin Farrell as fantasy behind-the-glass versions of Ledger (fine though all three men are) comes across as a forced contrivance, like shooting “Bela Lugosi” from behind. Hmmm… I liked this a lot, but it shouldn’t surprise me that you didn’t. Maybe I like movies like this and Drag Me to Hell (another carnival of weirdo images, though obviously more tied to story and genre) because they allow me to project my own beliefs onto them– that is, they invoke concepts closely tied to Christianity and esp. Catholicism, such as hell and free will (which I think is at the center of Imaginarium), in a purely visceral and thus intellectually open-ended way. I also used to be a Lynch fanboy and still admire him in a limited way, which gives me a taste for deliberately obscure narratives like this. I think you’ll be pleasantly surprised by BRAZIL if you ever choose to watch it. I wasn’t crazy about IMAGINARIUM either, but I always find something of value in a Gilliam film because of the visuals. I wasn’t bothered by the lack of whimsy — this film is all about how the world has turned its back on fantasy and story and stuff like whimsy, so I thought it appropriate that it would all seem a little labored. 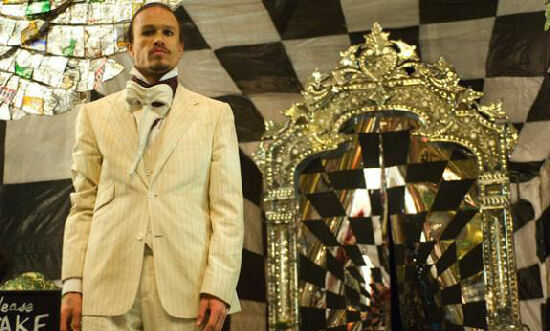 I think some of the best visual stuff involved the stage performances of Parnassus and his crew, including the costuming. I also loved the road-side bar inside the Imaginarium that seemed to be the Devil’s domain. Also, I like the fact that Gilliam’s one of the few directors who actually tries to work in the genre of traditional Fantasy (i.e. : the fairy tale kind). He plays around with fairy tales and myth and the idea of the fantastic and since I really dig all that stuff, I’m willing to forgive, as you accurately put it, his “wretched excess.” It’s such an underrepresented genre in movies, that I’m grateful for any scrap of this type of fantasy I can get, even if it’s in the form of an undisciplined mess. Also, Tom Waits as the Devil was pretty awesome. He was the best thing in the film.